Ricin (pronounced /ˈraɪsɨn/) is a protein derived from the seed of the castor oil plant (Ricinus communis) that is highly toxic to humans, as well as to other animals, including insects. Ricin causes cell death by inactivating ribosomes, which are the site of protein synthesis. Although both prokaryotes and eukaryotes have ribosomes, bacterial ribosomes are not generally susceptible to ricin; plant ribosomes also are less susceptible than animal ribosomes (Cornell 2001). With perhaps just one milligram or less sufficient to kill an adult person, and just a single ricin molecule able to inactivate over 1,500 ribosomes per minute, killing the cell (Cornell 2001), ricin has been developed as a biochemical agent. Able to be produced in liquid, crystal, or powdered form, for delivery by inhalation, ingestion, or injection, and with no antidote for ricin poisoning, this highly toxic and stable protein is considered moderately threatening as an agent in warfare or terrorism (Lerner and Lerner 2004; CDC 2008). However, unlike some other biological agents (anthrax, smallpox), ricin poisoning is not contagious and cannot spread from person to person through casual contact. Accidental poisoning is unlikely, other than ingestion of castor beans (CDC 2008). For the castor oil plant, ricin serves as an adaptation that offers protection to the plant against insects and other animals. Its complex structure and mechanism of action, involving two polypeptide chains, while serving threateningly for warfare and terrorism, also is being explored for medicinal value as a mechanism to kill cancer cells. Ricin structure. The A chain is shown in blue and the B chain in orange. The castor oil plant, Ricinus communis, is a plant species of the Euphorbiaceae family and the sole member of the genus Ricinus. Its seed is the "castor bean," which, despite its name, is not a true bean. Castor seed is the source of castor oil, which has a wide variety of uses, including as a food additive, for medicinal purposes, and for industrial applications in transportation, cosmetics, and manufacturing industries, such as for brake fluids and hydraulic fluids. The seeds contain between 40 percent and 60 percent oil that is rich in triglycerides, mainly ricinolein. They also contain the poison ricin, which is also present in lower concentrations throughout the plant. Ricin is constructed of two protein subunits, joined by a disulfide bond. The B polypeptide chain allows the ricin to enter the cell by binding with the glycoproteins and glycolipds (those that end with galactose) on the surface of cell membranes and then the ricin is transported into the cell by endocytosis. The A polypeptide chain impacts the ribosomes, binding with the 60S ribosome and stopping the protein synthesis, causing cell death. (Fleming-Michael 2005; Lerner and Lerner 2004). Ricin is poisonous if inhaled, injected, or ingested, acting as a toxin by the inhibition of protein synthesis. Poisoning can also occur by skin (dermal) exposure, although it is unlikely to be fatal unless combined with a solvent (Lerner and Lerner 2004). Ricin causes death generally within five days, if exposure does not cause death by that time, the victim likely will survive (Lerner and Lerner 2004). As a biological weapon, ricin is a very stable molecule that is able to withstand environmental changes, it is easy to obtain, and there is no antidote (Lerner and Lerner 2004). A vaccine is in development (Fleming-Michael 2005). Symptomatic and supportive treatment is available. Long term organ damage is likely in survivors. Ricin causes severe diarrhea and victims can die of shock. Deaths caused by ingestion of castor oil plant seeds are rare (Aplin and Eliseo 1997). Eight beans are considered toxic for an adult (Wedin et al. 1986). A solution of saline and glucose has been used to treat ricin overdose (Kopferschmitt et al. 1983). The case experience is not as negative as popular perception would indicate (Rauber and Heard 1985). Ricin is classified as a type 2 ribosome inactivating protein (RIP). Whereas Type 1 RIPs consist of a single enzymatic protein chain, Type 2 RIPs, also known as holotoxins, are heterodimeric glycoproteins (consisting of two subunits). Type 2 RIPs consist of an A chain that is functionally equivalent to a Type 1 RIP, covalently connected by a single disulfide bond to a B chain that is catalytically inactive, but serves to mediate entry of the A-B protein complex into the cytosol. Both Type 1 and Type 2 RIPs are functionally active against ribosomes in vitro; however, only Type 2 RIPs display cytoxicity due to the lectin properties of the B chain. In order to display its ribosome inactivating function, the ricin disulfide bond must be reductively cleaved (Wright and Robertus 1987). The tertiary structure of ricin is a globular, glycosylated heterodimer of approximately 60,000 to 65,000 daltons. Ricin toxin A chain (RTA) and ricin toxin B chain (RTB) are of similar molecular weight, approximately 32 kDA and 34 kDA respectively. Ricin A Chain is an N-glycoside hydrolase composed of 267 amino acids (Olnes and Pihl 1973). It has three structural domains with approximately 50% of the polypeptide arranged into alpha-helices and beta-sheets (Weston et al. 1994). The three domains form a pronounced cleft that is the active site of RTA. Ricin B Chain is a lectin composed of 262 amino acids that is able to bind terminal galactose residues on cell surfaces (Wales et al. 1991). RTB form a bilobal, barbell-like structure lacking alpha-helices or beta-sheets where individual lobes contain three subdomains. At least one of these three subdomains in each homologous lobe possesses a sugar-binding pocket that gives RTB its functional character. Many plants such as barley have molecules with the A chain but not the B chain. People do not get sick from eating large amounts of such products, as ricin A is of extremely low toxicity as long as the B chain is not present. The ability of ricin to enter the cytosol depends on hydrogen bonding interactions between RTB (ricin toxin B chain) amino acid residues and complex carbohydrates on the surface of eukaryotic cells containing either terminal N-acetyl galactosamine or beta-1,4-linked galactose residues. Additionally, the mannose-type glycans of ricin are able to bind cells that express mannose receptors (Magnusson et al. 1993). Experimentally, RTB has been shown to bind to the cell surface on the order of 106-108 ricin molecules per cell surface (Sphyris et al. 1995). The profuse binding of ricin to surface membranes allows internalization with all types of membrane invaginations. Experimental evidence points to ricin uptake in both clathrin-coated pits, as well as clathrin-independent pathways including caveolae and macropinocytosis (Moya et al. 1985; Nichols and Lippincott-Schwartz 2001). Vesicles shuttle ricin to endosomes that are delivered to the Golgi apparatus. The active acidification of endosomes are thought to have little effect on the functional properties of ricin. Because ricin is stable over a wide pH range, degradation in endosomes or the low pH lysosomes offer little or no protection against ricin (Lord et al. 2003). Ricin molecules are thought to follow retrograde transport through the Golgi and enter the endoplasmic reticulum (ER). For ricin to function cytotoxically, RTA (ricin toxin A chain) must be reductively cleaved from RTB in order to release a steric block of the RTA active site. Currently, it is unknown whether this takes place in the ER or in the cytosol. It is speculated that within the ER, RTA utilizes the endoplasmic reticulum-associated protein degradation (ERAD) pathway that exists to eject misfolded proteins to the cytosol (Roberts and Smith 2004). Chaperones participating in ERAD may recognize RTA as misfolded native protein and translocate it into the cytosol. Additionally, RTA resists degradation by ubiquitination that often occurs with misfolded proteins by maintaining a low content of lysine residues, the usual attachment sites for ubiquitin (Deeks et al. 2002). In the cytosol, RTA is free to exert its toxicity on ribosomes. Study of the N-glycosidase activity of ricin was pioneered by Endo and Tsurugi (1987), who showed that RTA cleaves a glycosidic bond within the large rRNA of the 60S subunit of eukaryotic ribosomes. They subsequently showed RTA specifically and irreversibly hydrolyses the N-glycosidic bond of the adenine residue at position 4324 (A4324) within the 28S rRNA, but leaves the phosphodiester backbone of the RNA intact (Endo and Tsurugi 1998). The ricin targets A4324 that is contained in a highly conserved sequence of 12 nucleotides universally found in eukaryotic ribosomes. The sequence, 5’-AGUACGAGAGGA-3’, termed the sarcin-ricin loop, is important in binding elongation factors during protein synthesis (Sperti et al. 1973). The depurination event rapidly and completely inactivates the ribosome, resulting in toxicity from inhibited protein synthesis. A single RTA molecule in the cytosol is capable of depurinating approximately 1500 ribosomes per minute. Sarcin-ricin loop substrate binds RTA active site with target adenine stacking against tyr80 and tyr123. Arg180 is positioned such that it can protonate N-3 of adenine and break the bond between N-9 of the adenine ring and C-1’ of the ribose. Bond cleavage results in an oxycarbonium ion on the ribose, stabilized by Glu177. N-3 protonation of adenine by Arg180 allows deprotonation of a nearby water molecule. Resulting hydroxyl attacks ribose carbonium ion. Depurination of adenine results in a neutral ribose on an intact phosphodiester RNA backbone. 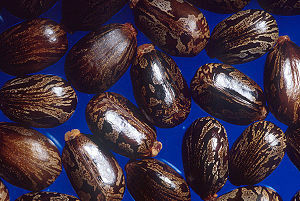 Ricin is easily purified from castor-oil manufacturing waste. In the United States, one million tons of castor beans are processed each year for production of castor oil (Lerner and Lerner 2004). The seed pulp left over from pressing for castor oil contains on average about 5 percent by weight of ricin. The ricin can be purified from this waste mash by chromatography (Lerner and Lerner 2004). A process for extracting ricin has been described in a patent application (US patent 3060165). The described extraction method is very similar to the preparation of soy protein isolates. The patent was removed from the United States Patent and Trademark Office (USPTO) database sometime in 2004. Modern theories of protein chemistry cast doubt on the effectiveness of the methods disclosed in the patent and state that "a parcel of misperception contributing to the lore of the poison ricin and the belief that it can be cooked up in the kitchen is US Patent 3,060,165," and that "nowhere in the patent do the creators demonstrate by procedure, data or even anecdote that pure ricin was obtained. In fact, what evidence … indicates the opposite" (GS 2004). Ricins may have therapeutic use in the treatment of cancer, as a so-called "magic bullet" to specifically target and destroy cancer cells (Lord et al. 2003): Ricin could be linked to a monoclonal antibody to target malignant cells recognized by the antibody. Modification of ricin is believed to be possible to lessen its toxicity to humans, but not to the cancer cells. A promising approach is also to use the non-toxic B subunit as a vehicle for delivering antigens into cells, thus greatly increasing their immunogenicity. Use of ricin as an adjuvant has potential implications for developing mucosal vaccines. Ricin is considered to be moderately threatening as a biological agent for warfare, being environmentally stable, highly toxic, easy to obtain, and without an antidote, but also not being communicable and requiring a large amount to cover a significant area (Lerner and Lerner 2004). The United States investigated ricin for its military potential during the First World War. At that time it was being considered for use either as a toxic dust or as a coating for bullets and shrapnel. The dust cloud concept could not be adequately developed, and the coated bullet/shrapnel concept would violate the Hague Convention of 1899. The war ended before it was weaponized. During the Second World War, the United States and Canada undertook studying ricin for use in cluster bombs. Though there were plans for mass production and several field trials with different bomblet concepts, the end conclusion was that it was no more economical than using phosgene. This conclusion was based on comparison of the final weapons rather than ricin's toxicity (LCt50 ~40 mg•min/m3). Ricin was given the military symbol W, or later WA. Interest in it continued for a short period after the Second World War, but soon subsided when the U.S. Army Chemical Corps began a program to weaponize sarin. The Soviet Union also had ricin. There were speculations that KGB even used it outside of the Soviet bloc, however this was never proven. In 1978, the Bulgarian dissident Georgi Markov was assassinated by Bulgarian secret police who surreptitiously "shot" him on a London street with a modified umbrella using compressed gas to fire a tiny pellet containing a 0.2 milligram dose of ricin into his leg (CNN 2003). He died in a hospital a few days later; his body was passed to a special poison branch of the British Ministry of Defence (MOD) that discovered the pellet during an autopsy. The prime suspects were the Bulgarian secret police: Georgi Markov had defected from Bulgaria some years previously and had subsequently written books and made radio broadcasts that were highly critical of the Bulgarian communist regime. However, it was believed at the time that Bulgaria would not have been able to produce the poison, and it was also believed that the KGB had supplied it. The KGB denied any involvement although high-profile KGB defectors Oleg Kalugin and Oleg Gordievsky have since confirmed the KGB's involvement. Earlier, Soviet dissident Aleksandr Solzhenitsyn also suffered (but survived) ricin-like symptoms after a 1971 encounter with KGB agents (Thomas 1998). Daily Mirror January 8, 2003 front page, part of a media frenzy in the United Kingdom when the ricin plot news was released. Among other ricin incidents were the arrest of six Algerian men in London on January 5, 2003 by Metropolitan Police with the police claiming the men were manufacturing ricin as part of a plot for a poison attack on the London Underground. Also in 2003, a package and letter sealed in a "ricin-contaminated" envelope was intercepted in Greenville, South Carolina, at a United States Postal Service processing center (CDC 2003). In November of that same year, ricin was detected in the mail at the White House in Washington, D.C.. This information was made public on February 3, 2004, when preliminary tests showed the presence of ricin in an office mailroom of U.S. Senate Majority Leader Bill Frist's office. There were no signs that anyone who was near the contaminated area developed any medical problems. Several Senate office buildings were closed as a precaution. Despite ricin's extreme toxicity and utility as an agent of chemical/biological warfare, it is extremely difficult to limit the production of the toxin. Under both the 1972 Biological Weapons Convention and the 1997 Chemical Weapons Convention, ricin is listed as a schedule 1 controlled substance. Despite this, more than 1 million metric tons of castor beans are processed each year, yielding a waste with significant ricin. To put ricin used as a weapon into perspective, it is worth noting that as a biological weapon or chemical weapon, ricin may not be considered very powerful in comparison with other agents such as botulinum or anthrax. Hence, a military willing to use biological weapons and having advanced resources would rather use either of the latter instead. Ricin is easy to produce, but is not as practical nor likely to cause as many casualties as other agents. Ricin is inactivated (in other words, the protein changes structure and becomes less dangerous) much more readily than anthrax spores, which may remain lethal for decades. The major reason it is dangerous is that there is no specific antidote, and that it is very easy to obtain (the castor bean plant is a common ornamental, and can be grown at home without any special care). There have been several reported incidents where ricin has been involved with infanticide where small children have been tricked into eating castor beans because of their striking resemblance to chocolate covered coffee beans. Ricin is actually several orders of magnitude less toxic than botulinum or tetanus toxin, but those are more difficult to obtain. Aplin, P. J., and T. Eliseo. 1997. Ingestion of castor oil plant seeds. Med. J. Aust. 167(5): 260–261. PMID 9315014. Retrieved July 18, 2008. Centers for Disease Control and Prevention (CDC). 2008. Facts about ricin. U.S. Department of Heath and Human Services, Centers for Disease Control and Prevention March 5, 2008. Retrieved July 17, 2008. Centers for Disease Control and Prevention (CDC). 2003. Investigation of a ricin-containing envelope at a postal facility: South Carolina, 2003. U.S. Department of Heath and Human Services, Centers for Disease Control and Prevention. Retrieved July 18, 2008. Cornell University Department of Animal Science. 2001. Ricin toxin from castor bean plant, Ricinus communis. Cornell University Department of Animal Science. Retrieved July 18, 2008. CNN. 2003. Ricin and the umbrella murder. CNN October 23, 2003. Retrieved July 18, 2008. Deeks, E. D., J. P. Cook, P. J. Day, et al. 2002. The low lysine content of ricin A chain reduces the risk of proteolytic degradation after translocation from the endoplasmic reticulum to the cytosol. Biochemistry 41: 3405–3413. Retrieved July 18, 2008. Endo, Y., and K. Tsurugi. 1987. RNA N-glycosidase activity of ricin A-chain: Mechanism of action of the toxic lectin ricin on eukaryotic ribosomes. J Biol Chem 262: 8128–8130. Endo, Y., and K. Tsurugi. 1998. The RNA N-glycosidase activity of ricin A chain. J Biol Chem 263: 8735–8739. Fleming-Michael, K. 2005. Vaccine for ricin toxin developed at Detrick lab. Ft. Detrick Standard Thursday, September 1, 2005. Retrieved July 18, 2008. Global Security.org (GS). 2004. The recipe for ricin, Part III: US patent, "the production of toxic ricin" intellectual property of the US Army. National Security Notes, July 23, 2004. Retrieved July 18, 2008. Kopferschmitt, J., F. Flesch, A. Lugnier, P. Sauder, A. Jaeger, and J. M. Mantz. 1983. Acute voluntary intoxication by ricin. Human toxicology 2(2): 239–242. PMID 6862467. Retrieved July 18, 2008. Lerner, K. L., and B. W. Lerner. 2004. Encyclopedia of Espionage, Intelligence, and Security. Detroit: Thomson/Gale. ISBN 0787675466. Lord, M. J., N. A. Jolliffe, C. J. Marsden, et al. 2003. Ricin mechanisms of cytotoxicity. Toxicol Rev 22(1): 53–64. Retrieved July 18, 2008. Magnusson, A. S., R. Kjeken, and T. Berg. 1993. Characterization of two distinct pathways of endocytosis of ricin by rat liver endothelial cells. Exp Cell Res 205: 118–125. Retrieved July 18, 2008. Monzingo, A. F., and J. D. Robertus. 1992. X-ray analysis of substrate analogs in the ricin A-chain active site. J Mol Biol 244: 410–422. Moya, M., A. Dautry-Varsat, B. Goud, et al. 1985. Inhibition of coated pit formatin in Hep2 cells blocks the cytotoxicity of diptheria toxin but not that of ricin toxin. J Cell Biol 101: 548–559. PMID 2862151. Retrieved July 18, 2008. Nichols, B. J., and J. Lippincott-Schwartz. 2001. Endocytosis without clathrin coats. Trends Cell Biol 11: 406–412. Retrieved July 18, 2008. Olnes, S., and A. Pihl. 1973. Different biological properties of the two constituent peptide chains of ricin, a toxic protein inhibiting protein synthesis. Biochemistry 12: 3121–3126. Retrieved July 18, 2008. Rauber, A., and J. Heard. 1985. Castor bean toxicity re-examined: A new perspective. Veterinary and Human Toxicology 27(6): 498–502. PMID 4082461. Retrieved July 18, 2008. Roberts, L. M., and D. C. Smith. 2004. Ricin: The endoplasmic reticulum connection. Toxicon 44: 469–472. Retrieved July 18, 2008. Sperti, S., L. Montanaro, A. Mattioli, et al. 1973. Inhibition by ricin of protein synthesis in vitro: 60S ribosomal subunit as the target of the toxin. Biochem J 136: 813–815. Sphyris, N., J. M. Lord, R. Wales, et al. 1995. Mutational analysis of the ricinus lectin b-chains: Galactose-binding ability of the gamma subdomain of ricinus communis agglutin b-chain. J Biol Chem 270: 20292–97. PMID 7657599. Retrieved July 18, 2008. Thomas, D. M. 1998. Alexander Solzhenitsyn: A Century in His Life. New York: St. Martin's Press. ISBN 0312180365. Wales, R., P. T. Richardson, L. M. Robers, H. R. Woodland, et al. 1991. Mutational analysis of the galactose binding ability of recombinant ricin b chain. J Biol Chem 266: 19172–79. Wedin, G. P., J. S. Neal, G. W. Everson, and E. P. Krenzelok. 1986. Castor bean poisoning. The American Journal of Emergency Medicine 4(3): 259–261. PMID 3964368. Retrieved July 18, 2008. Weston, S. A., A. D. Tucker, D. R. Thatcher, et al. 1994. 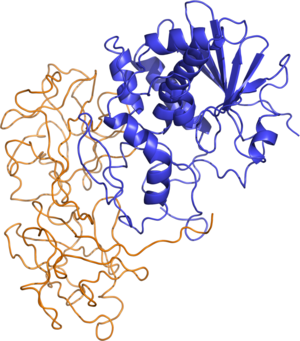 X-ray structure of recombinant ricin A-chain at 1.8 A resolution. J Mol Biol 244: 410–422. Retrieved July 18, 2008. Wright, H. T., and J. D. Robertus. 1987. The intersubunit disulfide bridge of ricin is essential for cytotoxicity. Arch Biochem Biophys 256: 280–284. Retrieved July 18, 2008. This page was last modified on 17 December 2008, at 02:37.